In this article written for PROJECT EVE I offer ideas to ignite your workplace spark. Our brains automatically put things into categories. When a new project at work resembles an old one, we have the advantage of experience, but the disadvantage of routine—creativity’s kryptonite. If we always approach tasks by way of the usual entrance, they begin to all look alike. When the front door to a project is wide open, it may seem like lunacy to climb a trellis to a third floor window, but your stained knees and scraped hands will have been worth it. It’s counter-intuitive, but true: self-imposed challenges are creativity’s kindling. Imagination loves a dare. 1. Emulate with a Twist: Painters traditionally learn their craft by copying master works. As a novelist and teacher, I sometimes challenge my students to do writing exercises in the style of the writers they most admire. In your workplace, try noticing the style and strategy of colleagues you’d like to emulate. How do they open a meeting? What is their manner of listening and speaking? What makes their emails distinct? What is it about their work that stands out? When you sit down to begin your next project, pretend you are that person. Inhabit her mind for a moment. Would she climb the trellis? Snake in through a basement window? Learn from as many different tactics as you can and select the best from each. Borrow from people with divergent approaches and combine them to create your own. The more styles you draw from, the richer the personal palette you’ll create. 2. Purposely Throw in a Monkey Wrench: Writer Jennifer Egan, a highly acclaimed novelist and short story writer, was already achieving success through conventional stories when she decided to write one in a series of 140-character tweets. Did she do this because she loved Twitter? No, because it exasperated her! She went out of her way to take a source of frustration and use it as a tool for creativity. By forcing herself out of her comfort zone, she achieved something wondrous. The resulting short story, “Black Box,” published and tweeted by The New Yorker, has become one of her most famous works. When approaching your next project, look at all entry points. If you feel comfortable going through the front door, a little spooked by the trellis, and absolutely resistant to sliding down the chimney, go for the chimney. 3. 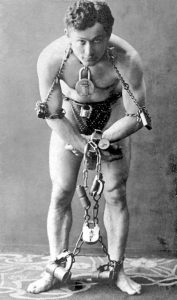 Use the Timer on your Phone: Not only did Harry Houdini intentionally shackle himself over and over again to test his wits, his feats almost always involved time constraints. Sometimes those constraints took the form of a ticking stopwatch. Underwater, the constraint was the waning breath in his lungs. Limited time brings vivid, intense focus to the mind. It frees us from the bramble of detail and self-doubt. Counter-intuitively, limitless time is the enemy of creativity. A notoriously slow writer, a year ago I challenged myself to write a complete first draft of a new novel within in a year, and to sweeten the pot, I decided the whole story would take place within seven days. I lit a yearlong fuse, which I could not snuff out without achieving my goal. Not only did the challenge enable me to complete the draft, the story is longer and more deeply layered than any I had previously written. Igniting your creativity is easy. Just test your wits with a few ironclad shackles, and watch your imagination light up. This article originally appeared as a guest post on the website PROJECT EVE: Reinvent Your Career.